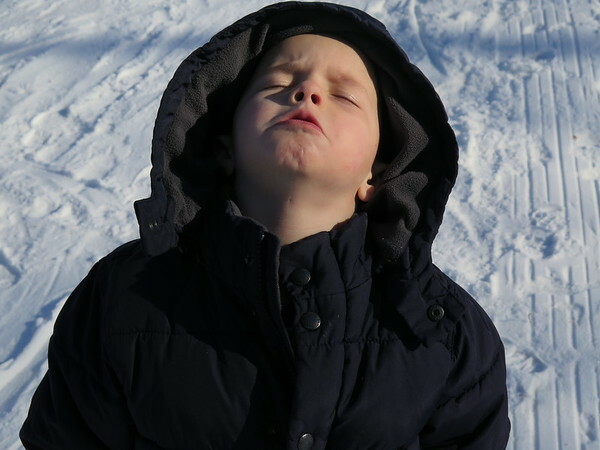 Montessori School of Greater Lafayette Blog | Has the mess got you stressed? There are alternatives to nagging your children to clean up. I had the great pleasure of working in my former classroom today and it reminded me of why the three-year cycle in Montessori classrooms is so beneficial, not least of all, to the teachers. Our Montessori preschool classrooms are composed of a mixed-age group of children who remain, ideally, in one classroom for three years. A child starts at age three and stays through her Kindergarten year. This is called the three year cycle. Each of those years brings new and unique learning opportunities for the child. 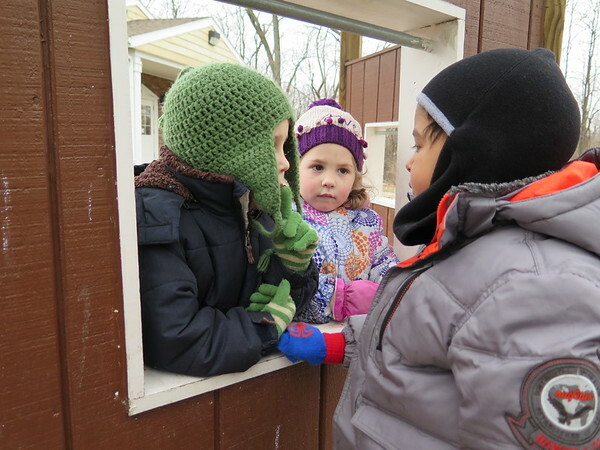 As a three-year-old, the child observes her older peers and benefits from their experience. As a four-year-old, she starts to see herself as one of the “big kids” and expands her social circle. In her Kindergarten year she is recognized as a leader and takes pride in helping others. It’s easy to see how the three-year-cycle benefits children, but it is also a tremendous opportunity for personal and professional growth for early childhood teachers. Few other settings offer the experience of observing and interacting with a child for half of that child’s life! When I took a sabbatical at the end of the school year in May, I left behind children who had been in my classroom for one or two years. I was able to catch up with many of those students today when I visited the classroom. 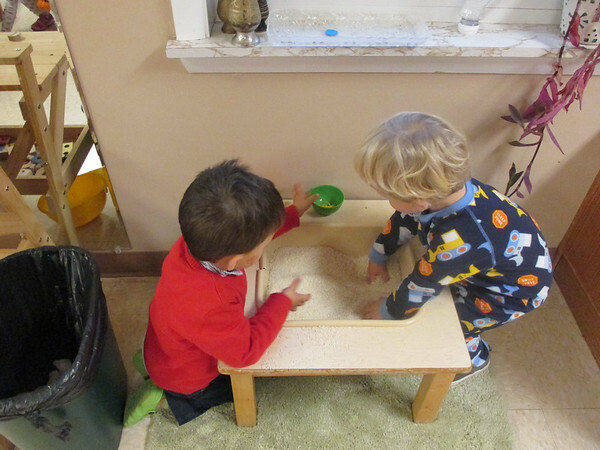 I observed that two of “my” third-year students, I’ll call them S and K, were part of what Montessorian John Chattin-McNichols calls a “roving pack of 5-year-olds.” They were wandering around with some other boys and mixing it up a little. I knew these two boys when they were just barely three years old. I knew them before they could consciously control their bodies at group time and even before they could dress themselves successfully. Now, here they were - big, bold 5-year-olds and I was curious to see who they had become eight months after we last worked together. Angie, my dear friend and the lead teacher of my former class, shared with me that S and K had been working on the squaring and cubing chains in the math area, so I asked them about those activities. They were eager to show me what they had already done and tell me what came next. Within a few minutes, they broke off from the pack and were ready to master the 10 cubing chain. The 10 cubing chain - or 1000 chain - is a concrete representation of 10 cubed. It’s made up of one thousand pea-sized beads organized into bars of ten. The bars of ten are attached at the ends to make a chain. Children are ready for this work after they have mastered the 1 - 10 squaring chains and the 1 - 9 cubing chains. 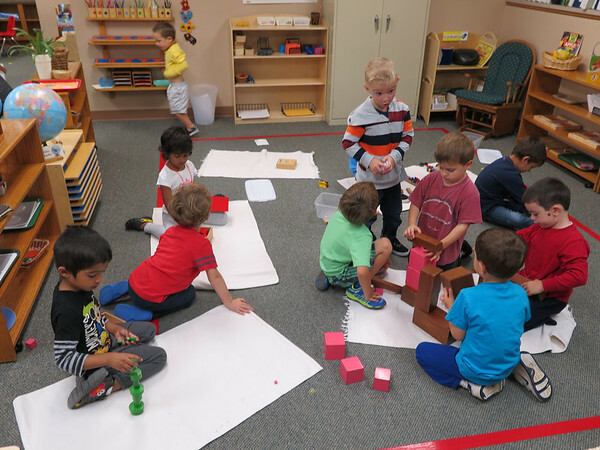 This video from the DuPage Montessori School in Naperville, Illinois provides a good overview of how the squaring and cubing chains are presented in the Montessori classroom. The 10 cubing chain is nearly 30 feet long so it must be laid out in the hallway outside the classroom. So, off to the hallway we went. S and K divided up the tasks between themselves. One carried the rolled-up mat and the other carried the chain. We established the space we would use in the hallway and K unrolled the mat while S went back into the classroom for the number tabs. 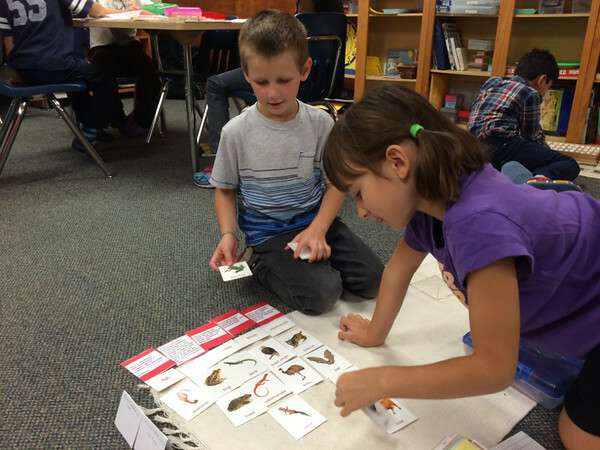 We discussed how they would sort the tabs on the tray and move it down the mat as they worked. That is certainly one way to do it. But when a child is ready for the 1000 chain, he is generally ready to complete it without counting every number because he can now count by tens and hundreds. Once you trust that 10 is ten, you don’t have to count it again. I asked if they thought they could first put tabs on the hundreds. Yes! They were sure they could. Together, we counted the bars as 10, 20, 30 and so on until we got to 100. S got the 100 tab and marked that spot. K quickly grasped the system and immediately went to work sorting out all of the hundreds tabs in a separate group so that S could place them. This was my cue to find something else to do. I went back inside the classroom to assist Miss Angie while the boys marked off every 100th bead on the chain with the appropriate tab. They repeated the process, stopping after each bar of ten. K was the sorter, S was the placer. “150! I need 150,” S said. K had it ready. There was never any disagreement, that I heard, over who would do which task. They just got started and they each found their niche as they went. And they were really digging their work. They started the cubing chain work at 9:45 and I checked in with them every few minutes. They finished at 11:00. One of them stopped to use the bathroom then went straight back to his work. Other children would step into the hall to see what was happening and then go back inside to their work. Sometimes I checked on S and K without speaking and other times I acknowledged their progress. Once, I said I would be back to check on them in a bit unless they needed some help. “We need some help,” S said. They could not find the tab for 590. I suggested they leave a space for that number and they could put it there when they found it. They never found it, but they were able to move on without hesitation. As they got to the very end, S picked up the 1000 tab and started to place it under the 1000th bead. K said, “Hey! We decided we would put that one on together!” And so they did. That’s when this photo was snapped. That doubtful voice is a familiar one to parents because most of us only get to experience the development of one or two children. We fear we will do something wrong and our children will not achieve their potential. Preschool teachers should know better because we get to observe hundreds of children over the course of our careers, right? But sometimes, even with years of experience, we forget that our job is simply to prepare a nourishing environment. It is the child who must do the work of building the man. Dr. Montessori also implemented the three-year cycle in our classrooms to give us enough time to look for that child and see him before he moves on to primary school. I am not at all surprised that S and K can count to 1000 by tens and hundreds. I am not surprised that they can recognize 3-digit numerals or that they can prepare, complete, and put away their work. I am not even surprised that two 5-year-old boys willingly work together on a math material for 1 hour and and 15 minutes with only a bathroom break and very limited guidance. I’ve seen it before. I am surprised at the sense of joyous relief I feel each time children reveal themselves in this way. It's an experience that never gets old. I suppose that’s the ultimate reward of being a teacher.